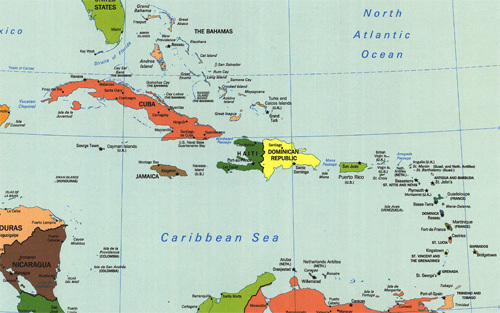 See how easily you can find the perfect vacation spot with a Caribbean islands map. Use this map of the Caribbean islands to find the perfect island you are your Caribbean escapades. I can definitely relate to that quote. I have always been a misplaced beach bum. "The beach," in my case, most often referred to the muddy ocean at Myrtle Beach, SC. It was not until later in life that I was able to go to the Caribbean. The first vacation I wanted to take after I started working was to the Caribbean islands. I just did not know where in the Caribbean - or that there were so many options! I had no idea what island I wanted to go, or what I wanted to do. I just knew that I want to go to the Caribbean, where the sun is brighter, the temperature is warmer and the water is clearer. I needed a map of the Caribbean islands to give me a few ideas and to narrow down my focus. I finally made my decision, and I was on my way. Details of that trip (and many others) are scattered throughout this site. The maps of the Caribbean islands below will help you narrow down your focus, so that you have your own excursions to share  and hopefully you will come here to tell your fellow Caribbean Amphibians all about it! Looking for individual Caribbean island maps? The weather map above is courtesy of The Weather Channel and Yahoo! Weather.